Nacházíte se: Booktook.cz → Odborná literatura → Cizojazyčné → Ostatní obory a další literatura → Anatomy and Physiology of Domestic Animals, 2nd Ed. Anatomy and Physiology of Domestic Animals, 2nd Ed. Anatomy and Physiology of Domestic Animals, Second Edition offers a detailed introduction to the foundations of anatomy and physiology in a wide range of domestic species. Well illustrated throughout, the book provides in–depth information on the guiding principles of this key area of study for animal science students, fostering a thorough understanding of the complex make–up of domestic animals. This Second Edition includes access to supplementary material online, including images and tables available for download in PowerPoint, a test bank of questions for instructors, and self–study questions for students at www.wiley.com/go/akers/anatomy. Taking a logical systems–based approach, this new edition is fully updated and now provides more practical information, with descriptions of anatomic or physiological events in pets or domestic animals to demonstrate everyday applications. 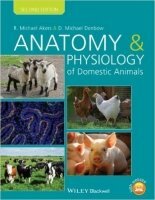 Offering greater depth of information than other books in this area, Anatomy and Physiology of Domestic Animals is an invaluable textbook for animal science students and professionals in this area.